Is something big coming related to heightened tensions either with Russia, Iran, or Syria? It appears the U.S. military is publicizing a "show of force" of sorts, but not exactly in the conventional way of deploying tanks, ships, and aircraft. This, according to the press release, is so that the Department of Defense (DoD) will have the "ability to provide a rapid response against threats made by aggressive actors." It comes amidst dangerously heightened rhetoric from both the White House and NATO which are threatening to finally pull out of the Intermediate-Range Nuclear Forces (INF) treaty, something which Russia says it will refuse to renegotiate. The build-up of ordinance in the heart of Europe also comes after months of back-and-forth threats between Washington and Iran as the latter attempts to survive an aggressive US sanctions regimen. 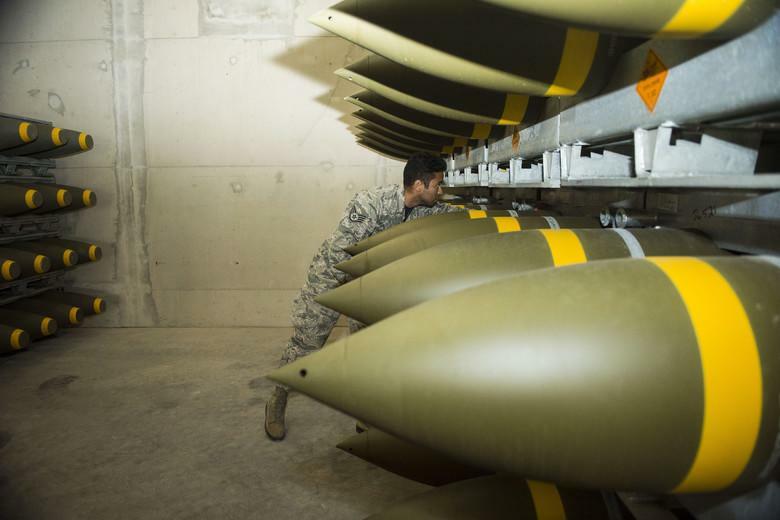 An Air Force spokesman said of the unusual size of the munitions transfer: “This is the largest shipment of its kind since Operation Allied Force, which took place in 1999,” according to af.mil. The spokesman, Master Sgt. David Head, referred to the 78-day NATO operation over Yugoslavia to bomb Serbian military positions and cities like Belgrade. “The munitions that we received will be used for future theater operations and the evolving U.S. European Command presence,” he added. International arms monitors and reports have frequently commented on a build-up of US and NATO forces and military equipment since the 2014 Russian annexation of Crimea after a referendum there saw a vast majority of the population vote to unite with Russia. Thousands of NATO troops and heavy weapons have since been deployed to Baltic States, Poland and southeastern Europe, also involving large scale and regular drills. Washington and NATO officials have cited "aggressive behavior" from Moscow as the reason for the concentration of forces. The INF treaty is expected to be at the top of the agenda when Presidents Vladimir Putin and Donald Trump are set to meet in Paris on November 11 on the sidelines of commemorative events of the 100th anniversary of the end of the First World War. Until then we expect the build-up both in terms of rhetoric and possibly weapons transfers into Europe to continue.